Born among the vineyards of Clos de Vougeot in Burgundy, Elisabeth lives and works just outside Lyon in beautiful France. As a kid, under choreographer Jean Serri, she danced to Ravel and Debussy at the Dijon Opera. Her eventful life led to her first experience sailing on the Bay of Angels, in Nice, her former home, and to playing piano in a rock group in New York. She has sewn, knitted, cut, designed, sung and danced, all while raising two free-spirited children. Finally, when she realized that designing and making one-off clothing would be a constant source of joy and inspiration, she moved to Paris, where she studied pattern making at the Chambre Syndicale de la Haute Couture. Stymied by the tough hierarchy of the fashion houses where she went to work for Messrs. Saint Laurent and Lagerfeld (Chanel), and too independent to toil under them, Elisabeth struck out to create her own haute couture line, LOLA BASTILLE. Some years later, during a round-the-world sailing trip, she discovered the joys of handmade wool felt in New Zealand. Once back in France, she went on to become a professional felt maker, which she has done for the past 10 years. Because felt is so versatile and endlessly inspiring, Elisabeth co-founded MORSE FELT STUDIO to produce felt as a stylistically distinct and durable textile for Interior Design. With her partner, Chloe Lecoup, she offers a contemporary expression combined with an awareness of a healthy planet to sensitive and curious customers, who cherish hand made wool textiles that make their home more pleasant, attractive and comfy to be in. Trained by Irit Dulman, and Fabienne Dorsman-Rey, Elisabeth has since introduced ecoprinting into her line. Transmitting her skill and know-how to young people interested in felt making, she welcomes internships in her studio year-round. 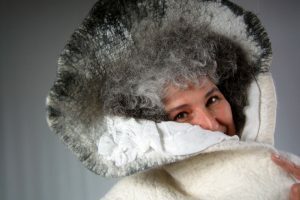 Elisabeth’s work has been featured in Felt Matters magazine; Felt Passion in Russia; No Serial Number; 500 Felt Objects publication; as well as various European blogs and magazines. Elisabeth was a finalist in the 2015 NIKKE AWARDS in Kyoto City Museum, Japan. Her most recent exhibition, Voyage au bout du feutre, was held at the Museum de Chazelles sur Lyon, in France. She is presently conducting acclaimed workshops in Italy, Switzerland, Germany, Italy, Belgium, and of course France. Each year she also conducts felt workshops at the Ecole Superieure des Arts Decoratifs-Paris in the department of Textile Design. Graceful and stylish in appearance or manner. A garment should allow such ease and grace since, unlike animals, we humans have to wear clothes. And, as we are all unique (as proven by our DNA), we in the West are free to express ourselves in our own way, choose our own forms of elegance and unashamedly be ourselves. Felt is my chosen vehicle for that expression. © 2017 Morse Felt Studio. All Rights Reserved.